It is the late 26th century. Earth is recovering from a catastrophic explosion that exterminated the majority of the population centuries ago and made most of the surface uninhabitable due to unearthly weather conditions. The surviving humans organized along four radically different ideologies, called Paths, to rebuild the world as they see fit: Harmony, Dominance, Progress, and Salvation. Followers of the four Paths live in a fragile peace, but in almost complete isolation next to each other. Their only meeting point is the last major city on Earth, now just known as the Capital. By powering up the mysterious Time Rifts that opened in the wake of the cataclysm, each Path is able to reach back to specific moments in their past. Doing so can greatly speed up their progress, but too much meddling may endanger the time-space continuum. Anachrony features a unique two-tiered worker placement system. 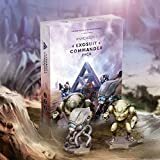 To travel to the Capital or venture out to the devastated areas for resources, players need not only various Specialists (Engineers, Scientists, Administrators, and Geniuses) but also Exosuits to protect and enhance them - and both are in short supply. The game is played in 4-7 turns, depending on the time when the looming cataclysm occurs (unless, of course, it is averted!). The elapsed turns are measured on a dynamic Timeline. By powering up the Time Rifts, players can reach back to earlier turns to supply their past "self" with resources. 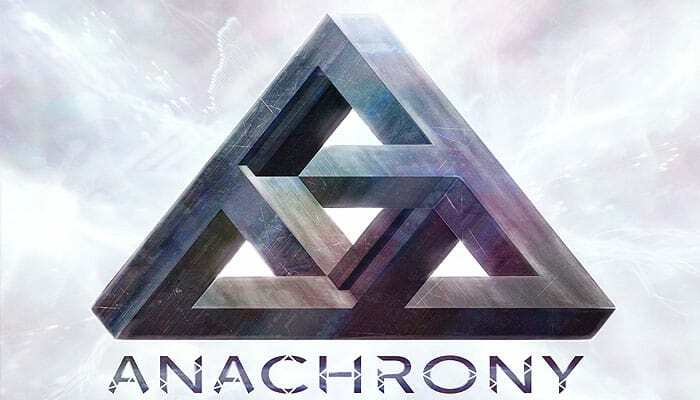 In Anachrony, you are the Leader of one of New Earth's ideological Paths: Harmony, Dominance, Progress and Salvation. Your ultimate goal is to prepare for an upcoming asteroid impact, secure the future of your people, and overcome the other three Paths as the dominant ideology in shaping humanity's future. Playing the Doomsday module, players can truly take humanity's fate into their hands. By conducting various Experiments, they can actively influence the event chain leading up to the Impact, which can potentially lead to mitigating its effects completely. The Chronobot is a solo play variant for Anachrony, playable with the base game only. The Chronobot receives its 6 Exosuits and 8 Warp tiles. It doesn't receive any Starting Assets (nor Workers). Leave all Endgame Condition cards in the box. Place the Chronobot board next to the Main board, and place the 6 Chronobot tokens on the 6 marked positions. The Chronobot is the First Player in the first Era. Place its Banner on the First Player spot. The player may still choose to use either the "A" or the "B" side of his Player board. With the Alternate Timeline gameplay variant, players can add another strategic twist to the Warp phase. After setting up the Timeline, turn each Timeline tile to its alternate (crimson-colored) side. Certain Warp slots on this side have bonuses or penalties associated with them. When playing with the Alternate Timeline, players have to follow the standard player order (clockwise, starting from the First Player) when revealing and placing their hidden Warp tiles. Collapsing Capital tile bonuses always apply in addition to the respective standard Action. Reduce the total cost of this Construct Action by one additional T, U or G (of your choice). Reduce the total cost of this Construct Action by one additional N.
If you Construct a building (not Superproject) with this Action on the first/second/third building spot of its respective row, you receive 1/2/3 VPs. The player(s) with the most Workers at the end of the game receive(s) 3 VPs. The player(s) with the most Water at the end of the game receive(s) 3 VPs. The player(s) with the most breakthroughs at the end of the game receive(s) 3 VPs. The player(s) with the most occupied building spots at the end of the game receive(s) 3 VPs. The base condition describes what assets the player needs to have in order to take the Eavcuation Action, and how many VPs it is worth in itself (regardless of the additional reward). The world has changed. It is the 26th century and New Earth is slowly recovering from the Day of Purgation: the day a mysterious, catastrophic explosion shook the entire planet. The majority of the population was exterminated, and most of the surface became uninhabitable. No one understood what really caused the apocalypse - the only thing the survivors could do was find shelter until the dust settled.